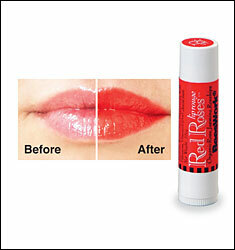 All-natural Red Roses™ lip rouge is handmade in small batches to ensure pure quality. Red lip stain goes on gently, then gradually ripens to a luscious shade of red, depending on individual body chemistry. Try natural lip stain on cheeks, too! Ingredients include organic rose hips, lavender, coconut oil, jasmine and peppermint. 0.15 oz.